Matthew is the most Jewish-centric of the Four Gospels. The apostle regularly invoked the writings of the Old Testament prophets in an effort to illustrate Jesus' identity as Israel's long-awaited Messiah. However, the gospel of Matthew has been notoriously difficult to date. Several factors speak to a date ranging from AD 60–65. First of all, the book makes no mention of the destruction of the temple, an event that occurred in AD 70. Such a cataclysmic event likely would have received some comment, particularly in a book so clearly influenced by Judaism. The largely Jewish character of the book also suggests it was written at a time when much of the evangelism by Christians was directed more exclusively at Jews, something that became less and less common as the decades passed. Finally, many scholars believe Mark to have been the first gospel composed, making it most probable that Matthew was written soon after. The Apostle Matthew, a Jew himself, offered a decidedly Jewish perspective on the ministry of Jesus. He included more than 50 direct citations—and even more indirect allusions—from the Old Testament. This exceeds any of the other gospels and indicates that Matthew had the Jewish population in mind when he sat down to write. Matthew's extensive connections between Jesus and the Old Testament provide ample prophetic evidence for Jesus' ministry but also give contemporary readers a glimpse into how first-century readers approached the Old Testament with a Christ-centred mindset. 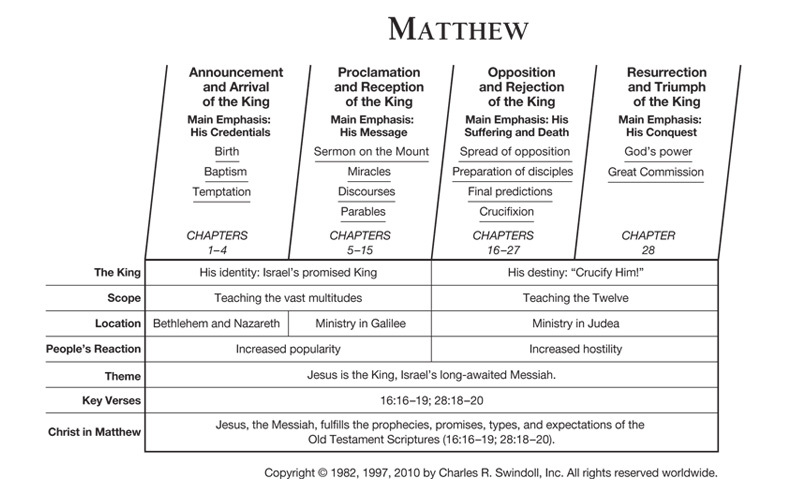 In addition, Matthew's gospel answers the question on the mind of every Jewish reader: “If Jesus is the King of the Jews, then where is God's promised kingdom?” Matthew reveals that Jesus did offer the kingdom to Israel, but the offer was rejected (Matthew 4:17; 16:13-28; 21:42-43). God's primary work in the world is now accomplished through the building of Christ's church, after which Jesus will come again to earth and establish His kingdom—ruling the world from Israel. Matthew wrote his account of Jesus' ministry to show that Jesus was and is indeed the King, Israel's long-awaited Messiah. He reflected this concern in his opening line, “The record of the genealogy of Jesus the Messiah, the son of David, the son of Abraham” (Matthew 1:1). From there, Matthew consistently took his readers back to the Old Testament, providing Old Testament testimony regarding the birth of Jesus, Bethlehem as the location of Jesus' birth, the flight to Egypt, Herod's slaughter of the infants, and the beginning of Jesus' ministry. In a world where many in the Jewish community had claimed the role of Messiah for themselves, Matthew's commitment to grounding the life of Jesus in the Old Testament raised Jesus above the multitude of these false messiahs. The apostle painted a portrait of our Lord that highlights His uniqueness among all others to ever walk this earth. Find resources in the book of Matthew in our resource library.